Automotive manufacturers have come a long way in developing rust prevention measures but the fact remains road maintenance crews dump millions of tons of salt and corrosive de-icing agents on Canadian roads each year. Plus the sun and natural environment is extremely hard on a vehicle’s finish. At London Honda we understand that you want to keep your vehicle looking great for years and that’s why we’re proud to offer the Sym-Tech line of aftermarket vehicle protection products through the London Honda Financial Services team. 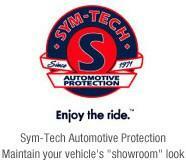 Sym-Tech Body Panel Protection, Underbody Protection and Paint Protection are a part of the complete Sym-Tech Automotive Protection Program and are backed by a fully insured warranty policy. You’ve spent a lot of money on your new vehicle and the addition of professionally applied Sym-Tech products will ensure that it keeps its value and ‘showroom looks’ longer. Sym-Tech Rust Protection is a specially formulated compound coating that provides excellent long term metal protection which is especially important in today’s unibody designs. Sym-Tech Underbody Protection extends the life of your vehicle by protecting it from the damaging effects of salt, stones, gravel and dirt. Sym-Tech Paint Protection is professionally applied to bond to the vehicle’s paint, creating a smooth impermeable finish so that dirt, salt, pollutants and moisture can’t get trapped in the finish and cause damage. To learn more about Sym-Tech products and why we recommend them to our customers call, visit or email our Financial Services team today. We’ll help you keep that ‘showroom look’.